In Ritual and Devotion Sangharakshita leads us through the sevenfold puja, a poetic sequence of devotional moods found in Tibetan and Indian forms of Buddhism. He explains that engaging in this way can help us commit ourselves to the spiritual journey with all our heart. Imagine a world without beauty, myth, celebration or ritual. It seems that to feel fully and vibrantly alive, these experiences are essential to us – helping us to feel in touch with all levels of our being by engaging our emotions, senses and imagination. Devotional ritual also speaks this language of the heart and can bring us closer to our highest ideals, but it can be a confronting aspect of Buddhism for some people in the West. However, for the Buddha’s teachings to have a real impact on our lives we need to have a deep feeling for the Buddha’s teaching, a clear understanding is not usually enough. 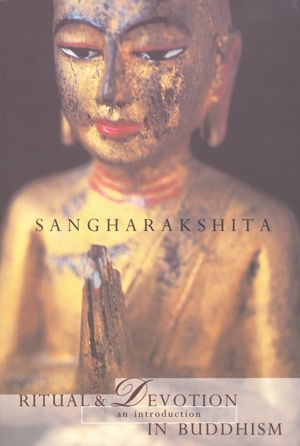 Skilfully steering us through the difficulties we may encounter, Sangharakshita leads us through the sevenfold puja, a poetic sequence of devotional moods found in Tibetan and Indian forms of Buddhism. Within this he discusses the use of chanting, offerings, recitation and other activities in creating ritual space and moods. Engaging in this way can help us commit ourselves to the spiritual journey with all our heart.